EP launch! 4pm 26/07/2015 at Mustard Stock! 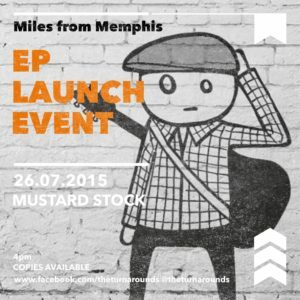 We cordially invite you all to join us at the launch event for our EP “Miles from Memphis” at Mustard Stock (The Mustard Pot in Chapel Allerton) at 4pm on the 26th of July. YES we know it’s been ages since we recorded it BUT it’s because we’ve been busy entertaining people and we find it hard to make meaningful decisions because we get distracted by sweet sweet cake. We’ll have CDs available, plus a surprise comedy/sporting item to go along with your purchase! For those who aren’t into physical CDs it will launch on the same day on iTunes, Amazon MP3, Google Play and multiple other online places.